Westbrook Pegler, the caustic columnist who spent years attacking “Reds,” was one of a half dozen Ridgefielders whose writings have won a Pulitzer Prize. His award-winning words weren’t about communists, however, but about labor union racketeering. Pegler lived here from 1941 to 1948 during which time he seemed better known locally for his attack on Ridgefield’s plumbing code and his efforts to collect bumpers than as a national newspaper columnist. Both these efforts occurred during World War II. While expanding his home on Old Stagecoach Road, Pegler wanted to use cheaper, unlicensed plumbers but the town code, modeled after the state’s and supported by unions, required the use of licensed plumbers. Pegler called it discriminatory and tried to get the Town Meeting to abandon the code. He failed. 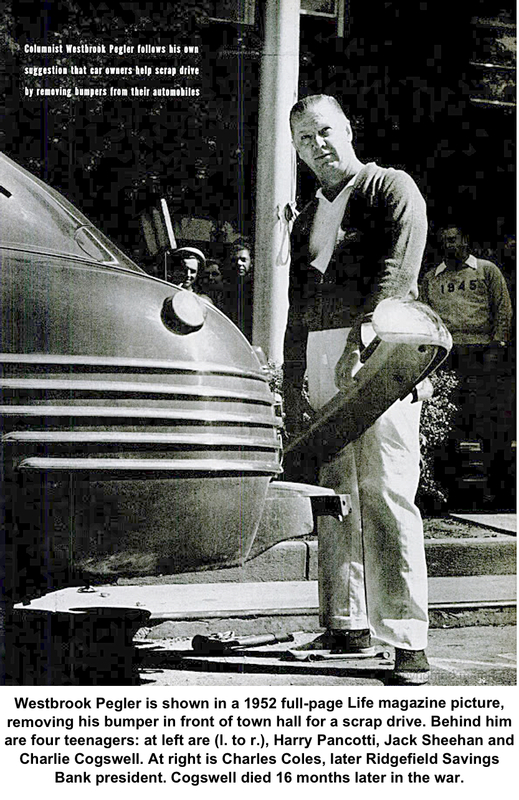 He was more successful in his campaign to get people to turn in their steel automobile bumpers to help the war effort – Life magazine featured a full-page picture of him removing his own bumper in front of the Ridgefield town hall. Francis James Westbrook Pegler was born in 1894 in Minneapolis, Minn., a son of a newspaper editor. By his early 20s, he was working for United Press and became the youngest American correspondent covering World War I. 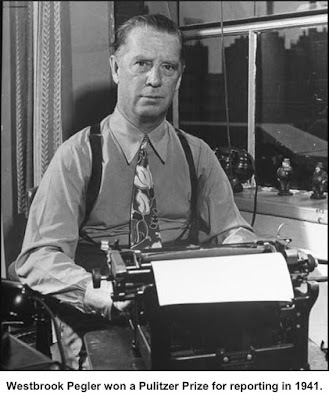 After the war he worked as a sports columnist for a while but, at the Chicago Tribune, soon turned to covering politics, labor, government, and other hard-news topics in a column he called “Mister Pegler.” By the late 1930s, the column, handled by the Scripps Howard syndicate, was carried in more than 115 newspapers and had an estimated six million readers. He was making $65,000 a year — that’s about $1.1 million in today’s dollars. “He depicted a world where a conspiracy of criminals, corrupt union officials, Communists, and their political allies in the New Deal threatened the economic freedom of working Americans,” wrote historian David Witwe in the Journal of Social History in 2003. Pegler probably reached his peak of popularity and power in the early 1940s when he helped expose a New York City racketeer named George Scalise, a union boss who happened to own a home in Ridgefield — what is now the St. Ignatius retreat house on Tackora Trail. An associate of mobster Dutch Schultz, Scalise was arrested in 1940 by the crusading district attorney Thomas E. Dewey, later governor of New York and almost-president, and was charged with extorting $100,000 ($1.7 million today) from hotels and contracting firms. But the arrest came only after Pegler had exposed Scalise in a series of anti-racketeering columns that won him the Pulitzer Prize for reporting in 1941. It was the same year he came in third in the voting for Time magazine’s Man of the Year, behind two of his most hated targets, President Roosevelt and Joseph Stalin. His research on Scalise probably introduced him to Ridgefield, and in 1941, he bought the 100-acre farm on Old Stagecoach Road. He eventually soured on the town, however. 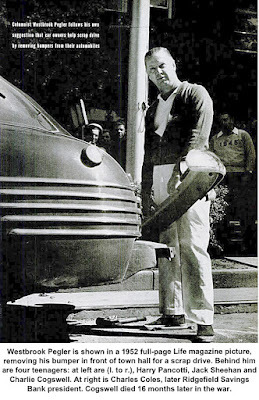 In a 1950 column, two years after he moved to Arizona, he described Ridgefield as “an old aristocratic town of moldering white mansions on a white main street” that “has quietly become infested with wealthy Sixth Columnists” (supporters of communism). When he was in his glory years, three books of Pegler’s columns were published: “T’ain’t Right” in 1936; “The Dissenting Opinions of Mister Westbrook Pegler” in 1938; and “George Spelvin, American, and Fireside Chats” in 1942. By the mid-1950s Pegler fell out of favor, and his columns appeared only in the magazine of the ultra-conservative John Birch Society. He died in 1969 in Arizona at the age of 74.